The ASP.NET scheduler itself must be placed inside an UpdatePanel control so it can be refreshed from the server side. Set UpdateMode to "Conditional" and ChildrenAsTriggers to "false" to prevent unnecessary scheduler refreshing. Add TimeRangeSelected event handler (DayPilotScheduler1_TimeRangeSelected). The modal dialog is created using four controls (ButtonDummyCreate, ModalPopupCreate, PanelPopupCreate, UpdatePanelCreate). The dummy Button control is used for ModalPopupCreate.TargetControlID (it is not possible to bind the ModalPopupExtender directly to the calendar). The PanelPopupCreate control must be hidden using style="display:none". Otherwise it would be visible on the initial page load. 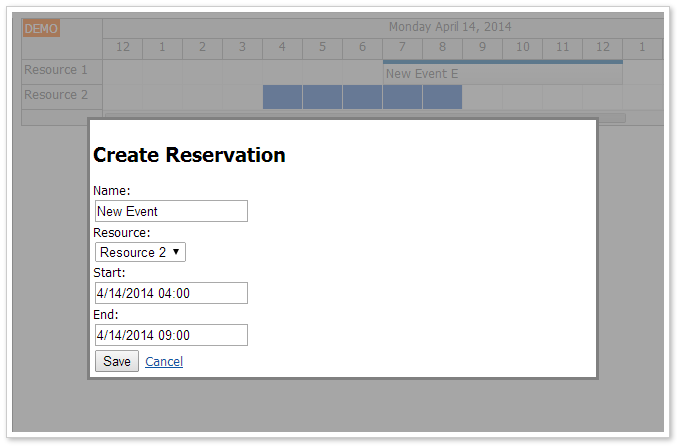 Enable event clicking using EventClickHandling property and create a new EventClickHandling event handler. Because of the UpdatePanel, EventClickHandling must be set to "PostBack". 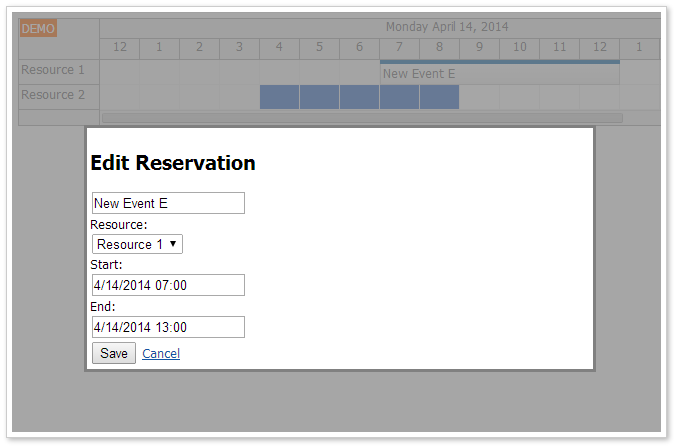 Add EventClick event handler (DayPilotScheduler1_EventClick). The modal dialog is created using four controls (ButtonDummyEdit, ModalPopupEdit, PanelPopupEdit, UpdatePanelEdit). The dummy Button control is used for ModalPopupEdit.TargetControlID (it is not possible to bind the ModalPopupExtender directly to the calendar). The PanelPopupEdit control must be hidden using style="display:none". Otherwise it would be visible on the initial page load.